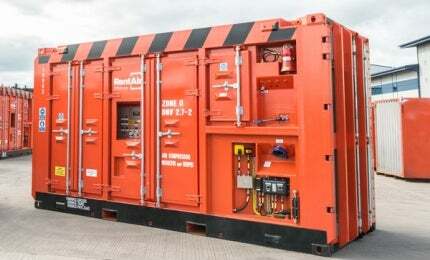 RentAir Offshore provides specialist rental equipment to the offshore energy industry. RentAir Offshore’s range of rental equipment, including air compressors, steam generators, heat suppression systems, heat exchangers, sand filters and air accessories, are designed to Zone II and rigsafe specification, meeting DNV2.7-1 and DNV2.7-2 certification standards. The company’s core products of air compression and steam generation support the needs of major oil and gas operators and service companies in the production of oil and gas, well testing, fabric maintenance, asset integrity and renewables. RentAir Offshore has the largest fleet of containerised air compressors for supporting offshore projects across the world. Their fleet consists of framed and containerised air compressors ranging from 130cfm to 1600cfm, and from 7 to 20 barg designed to operate in Zone II hazardous areas and safe zone locations. Zone II containerised air compressors are ideal for operations such as well testing and oilfield applications in hazardous areas. The compact footprint, containerised housing, and forklift slots make it easy and cost-efficient to transport, whilst simple stacking ability further reduces use of space offshore. The internal access hatch provides offshore personnel with safe operational and servicing capability. Clients benefit from the latest Zone II technology, for operation in hazardous areas, as well as DNV2.7-1 and DNV2.7-2 certification standards. RentAir Offshore has an extensive fleet of steam generators providing outputs ranging from 4.5 Mmbtu and 5.8 Mmbtu in Rigsafe and Zone II DNV2.7-2 standards. The company’s steam generators are ideal for well testing operations and maintenance. The steam generators can be coupled to the RentAir Offshore heat exchangers to give a complete heating solution. In addition to the expanding fleet, the company has designed and launched the Zone II steam generator certified to DNV2.7-2 certification standards. The units are enclosed in purpose-built containers that house the control system, water and fuel tanks allowing economic transportation with a single lift strategy. The recent addition of equipment to allow full compliance with the DNV2.7-2 standard ensures a high-degree of safety in operation through additional features including gas and fire detection and suppression. RentAir Offshore has launched new heat suppression systems, which feature 25 safety innovations, including Free-Flow Nozzle™. The patented and certified systems are uniquely designed to provide maximum safety for personnel offshore. The systems have been designed, manufactured and certified with complete safety in mind. In comparison with fixed existing systems that require a crane to remove, RentAir Offshore systems are designed on a simple pivot arrangement so company representatives simply walk along the clear walkway on the flare boom and unlock the pins, so a crane is no longer required. RentAir Offshore heat exchangers are used to heat a number of fluids found in oil and gas production. They comprise a pressurised shell containing a set of process coils. Steam is piped from an external steam generator into the shell to heat the process fluid flowing through the process coils. RentAir Offshore’s range of portable, frame-mounted 10,000psi and 15,000psi heat exchangers are often used with surface well testing applications and pipeline cleaning to complete the package of heat transfer during well test and chemical cleaning operations. RentAir Offshore rental fleet of sand filtration units are provided to enhance the well test packages in common use in the oil and gas industry. They improve well analysis during testing operations through the effective removal of sand and other solids from the well fluids. The sand filters consist of two vertical pots that each holds an inner filter cartridge. The pots can be controlled individually to allow single or dual-usage, and are used in a duty and standby mode, where one pot is operational while the second pot is being cleaned. Each sand filter is supplied with its own support container that holds spares components, sand skip and filter cartridges. Global equipment rental specialist RentAir Offshore has launched a suite of new equipment for the offshore industry in full compliance with the very latest safety standards to ensure maximum safety in hazardous drilling areas.